Hooray! I have finally managed to track down some spaghetti squash and cook it for the first time. All my American friends have been using it for years but I have never seen it in my local supermarket. I decided to make a “How to cook spaghetti squash video to show you just how easy it is. So what is spaghetti squash, how do you cook it, how do you use it and how many carbs is it? What is spaghetti squash? – it is part of the squash family which is grown above ground, large in size and varies in shades of yellow to orange. How to cook spaghetti squash? – It is used as a low carb alternative to spaghetti and can be baked, boiled, microwaved or steamed. Boiling or steaming has a tendency to make the spaghetti squash strands a little on the soggy side, so I prefer to bake it as shown in the ‘how to cook spaghetti squash video’. Serving spaghetti squash – it can be served simply with butter and garlic (my favourite) or with a spaghetti sauce, or used in any other pasta recipe. Carbs in cooked spaghetti squash – Per 150g (1 cup) there are 10g total carbs, 2g fibre (so 8g net carbs). Now compare this with 1 cup (140g) cooked wheat spaghetti which has 43g carbs, 3g fibre (so 40g net). Spaghetti squash also contains Vitamins A, B6, C, niacin, manganese, and thiamin. UPDATE – Cooking spaghetti squash in the microwave – Cut through the skin and pierce into the centre 8-10 times. Place the WHOLE spaghetti squash in the microwave. Cook on HIGH for 5 minutes, turn over, cook for another 5 minutes on HIGH. Remove the spaghetti squash from the microwave onto a chopping board. Now that the skin is cooked and soft, you can easily cut the squash in half. Remove the seeds and place one half in the microwave, cook on HIGH for 1 minute. Repeat with the other half. What a wonderful way to get more vegetables into your children. No more pasta, which in effect is just cooked starch. Let them pull the strands from the cooked spaghetti squash. It’s so much fun letting them help out with the meal and learning to cook at the same time. 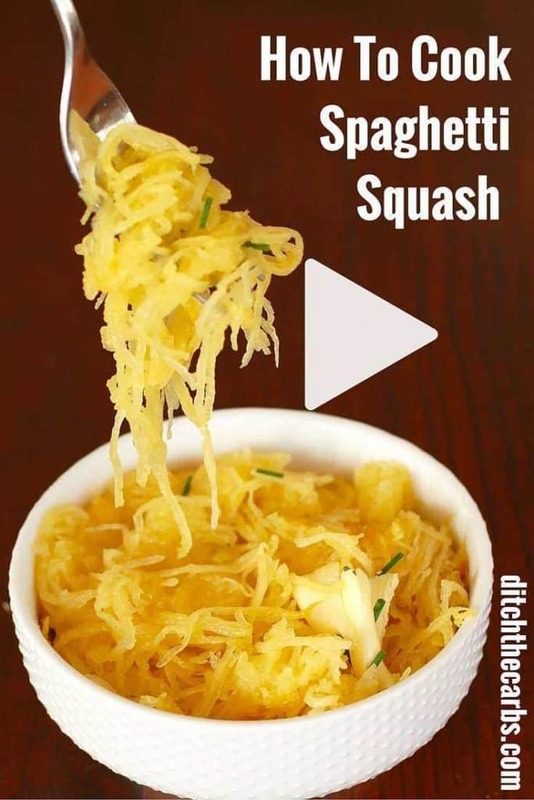 My little how to cook spaghetti squash video will show you once and for all how easy it is to make, and how amazing strands of spaghetti squash are made, as if by magic! Watch the "How to cook spaghetti squash video". Cut the spaghetti squash in half and scoop out the seeds with a spoon. Drizzle olive oil inside the spaghetti squash and rub all over. Oil a large baking dish and place the spaghetti squash cut side down. Pierce the hard skin a few times (6-8). Bake at 180C/350F for 30 - 50 minutes depending on the size of the spaghetti squash you used. It is ready when the skin can be pressed down with your fingers gently. Test by turning over the spaghetti squash and with a fork, scrape away at the sides to separate the spaghetti strands, if they pull away easily, it is cooked. Serve with plenty of butter and garlic or sauce of choice. If you are looking for more pasta alternatives, why not try out my salmon and pesto zoodles, or our family favourite, spaghetti bolognese. Both can be made with zoodles or spaghetti squash, so if you have been buying gluten free pasta, nows the time to ditch them forever and start making your own nutritious past alternatives. Remember gluten-free foods are highly processed and devoid of much nutrition at all. There are so many recipes here, all naturally gluten-free without a gluten-free product in sight. Just bought one of these today, can’t wait to try it! My son enjoyed your video so will get him to help me cook it! This is my first time to make and even eat Spaghetti Squash. I enjoyed the taste and texture! I have one-half leftover. Do you know if it keeps well over night in the refrigerator? Should it either be left in the cooked skin or cleaned out of the skin? Thank you in advance for your response. I generally scoop it all out of the skin and keep it covered in the fridge for up to 3 days and then reheat in the microwave or oven when needed. Oh fantastic Libbie. I saw it years ago in my local green grocer but have not seen it since, even though we only shop now at farmer’s markets at Frenchs Forest in Sydney. Really hoping I find some as I would love to try it. Bit over the zoodles at the moment. I love your recipes! You make everything so easy – even for people like me who don’t cook. I don’t do spaghetti squash any more because even at 8 net carbs it is a little too high to my way of thinking. I use carrots that I spiralize instead. Has more nutrition, twice as much potassium and some other nutrients that the squash just doesn’t have like ones for eye health above and beyond the better levels of carotenoids and AMD nutrients. Plus the net carbs are only 6 per 1 cup cooked and the carrot noodles taste sweeter in other dishes where you wouldn’t use the squash like Thai dishes or guisados (Mexican stews with less juice). But that’s just me. but some of us are on low carb. And carrots aren’t an acceptable food choice.